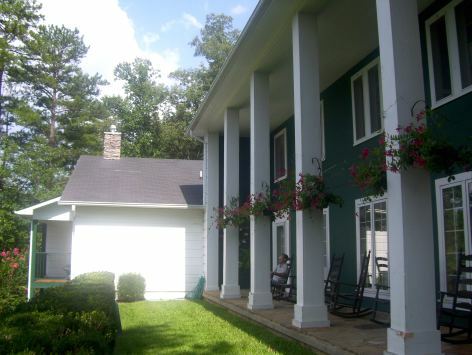 The Buckhorn Inn Gatlinburg is an attractive bed and breakfast hotel that offers a number of lodging options. There are six traditional rooms and three premiere rooms in the main building of the inn, all furnished with charm. 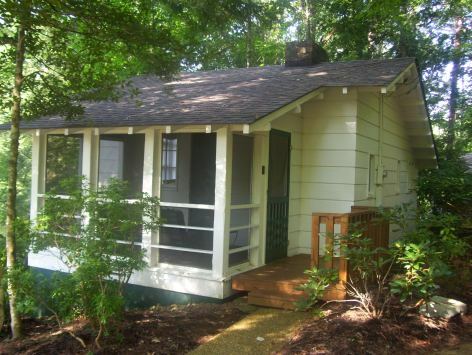 They also have seven private cottages located in the woodlands around the area. An additional three guest homes are available for those who want a lot of space and privacy. Most rooms and all of the small private cottages have mountain views. The cottages are cozy and rustic with a wood burning fireplace, bath with a nice Jacuzzi tub, sitting room area, a functional kitchenette, screened porches and decks. The Inn is a welcome change from the noise and crowds of downtown Gatlinburg, and it is nestled in the foothills of the Smokies, but you'll feel a thousand miles from civilization. Our favorite activity while here was actually no activity at all. There's a gorgeous back porch perfect for rocking, listening, and viewing the great views with a nice glass of red wine. 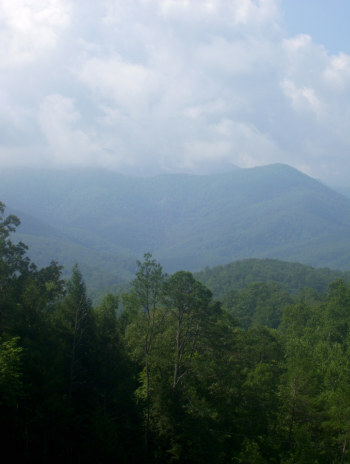 The Buckhorn Inn Gatlinburg is surrounded by twenty-five acres of meadow and forest featuring quiet walkways, a self guided nature trail, a sixty foot meditation labyrinth and a fish and duck pond. Remember to take some bread (you can get it at the front desk) if you visit the pond you can feed the ducks and swans. It takes about an hour or two to get through the moderately difficult nature trail, but you'll see all kinds of plants and animals native to the Great Smoky Mountains. The Buckhorn Inn Hotel is also a great place to start your exploration of the nearby National Park. My wife and I received a recommendation to stay at the Buckhorn Inn Gatlinburg from some good friends. We spent two nights at the Buckhorn; it was our first time here. The Inn itself is quietly understated and lovely with a wonderful attention to detail. We stayed in the Tower Room which is certainly one of the most unique rooms we have ever stayed in, anywhere. It is sort of like staying in a tree house. In all it has three levels with small living spaces. The lower level has a seating area, a mid level with a dresser and a large bathroom with a tub, and the third level with a nice bed and a wall of windows all around with a delightful mountain views. We also very much enjoyed our private deck. The red room is particularly pretty - we checked it out as we went by, and the blue room is very attractive, too. You can check in at three pm, and if you can't show up by nine, you'll need to get special instructions for checking in. If you've made dinner reservations at the wonderful Buckhorn Inn Gatlinburg restaurant, you need to show up by six-thirty. You can check out at eleven in the morning, but also be aware that on weekends and holidays there's a two or three night minimum stay. The meals in the restaurant are incredible and you get a reservation for breakfast free with the price of your room and only open to overnight guests. The meal that's served between eight and nine-thirty every morning is something that kept us going for most of the day, so don't be tempted to miss it. Everyone was so willing to help us - it was a real surprise after the service at some of the hotels we've stayed at. The Inn also provides sack lunches for guests if they're ordered the night before and formal lunches for groups by special arrangement. Dinner is open to the public and features a special four course meal with soup, salad, bread, entree, dessert and coffee, with seating starting at seven every evening. If you're going to be staying in the Gatlinburg area, it's worth your time to make a reservation at the Buckhorn Inn Gatlinburg. This beautiful, luxurious and above all peaceful bed and breakfast will give you a pleasant night's sleep, a great breakfast in the morning, and top notch service that will make you feel like part of the family. 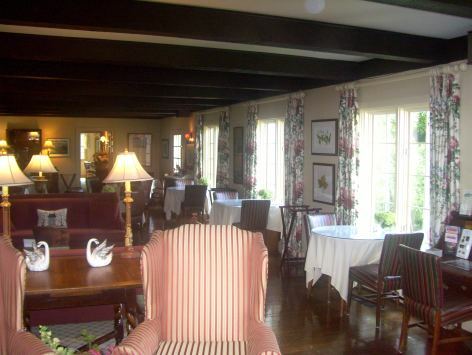 Make sure you visit the family room area and take time to read all the history belonging to this famous Inn, as well as the noteable awards. If bright lights and big crowds aren't your thing, this secluded Inn might be the better choice. We know we'll be back for another stay in the future!